Proudly Offering Made in USA Bedding! No Time to Wait? Ready to Ship Now! * Shown as a typical comforter, but will be sewn as a zipper comforter. You can also get this made as a fitted comforter (boxed corners at bottom, but no zipper or under straps). 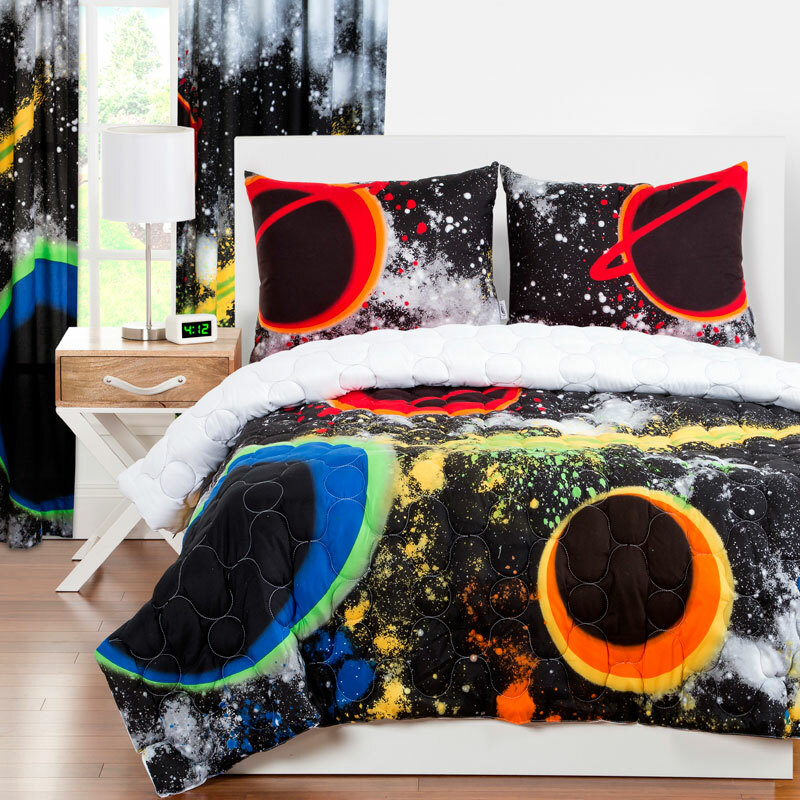 This “Out of this World” Space all in one bedding is made from 100% super-soft brushed polyester micro-fiber. It is machine washable and super soft. Comes with the matching sham(s), too! Fun concept that kids love! Every night is a sleep over! Kid friendly design – just zip up the side zipper and voila, bed made! All in One design – throw it all in the wash together! These comforters come standard without elastic on the bottom (sort of a fitted sheet without the elastic in place,) so they stay secure by using straps that connect under the mattress. If you would like it to wrap around the mattress as well as have the straps, you can choose to add these. I feel it provides a cleaner look, especially if you have a shallow mattress. Would you like to add elastic to your zipper comforter? This “Out of this World” Space all in one bedding is made from 100% super-soft brushed polyester micro-fiber. It is machine washable and super soft. Comes with the matching sham, too! * Twin size comes with 1 sham; Full size comes with 2 shams. * This bedding is custom and made to order, therefore it is non returnable unless there is a manufacturing defect. Fabric Swatches are a great way to match your existing decor, compare designs, or just to see & fee the fabric! 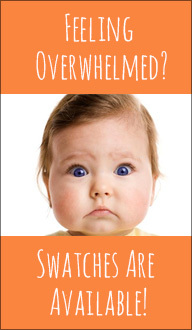 Swatch costs will also be deducted from your upcoming order! Shop with us for all your Bunk Bed Bedding! Outstanding customer service! When you're happy, I'm happy! I put everything into this business and love my customers! Have questions? Send an email, text or call! 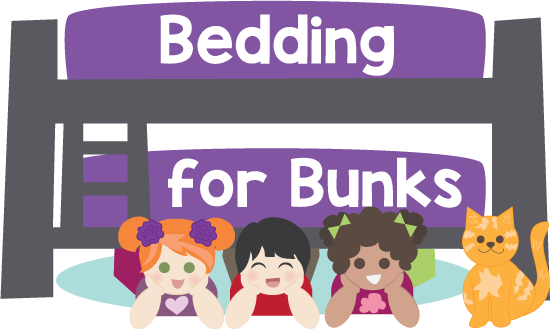 Bedding for Bunks specializes in bunk bed bedding and bunk room designs! This website is devoted to ONLY custom bunk bed bedding and accessories, so are experts at what we do! Bedding for Bunks is secure! Our site is encrypted with SSL, so your information is always safe. Plus, we use a trusted third party processor, so that none of your financial information is ever stored on our servers. Bedding for Bunks supports U.S. manufacturing! Nearly all of our kids bunk bed bedding & accessories are made in the USA! Bedding for Bunks is woman-owned and operated! Reviews for our Bunk Bed Bedding! "Kelly, Received our bunk bed bedding yesterday. I’m so pleased with the fit and quality of the bedding! Thank you so much! Our granddaughters will be thrilled!" "Couldn’t be more pleased with the fitted comforter and pillows we had custom made!!" "I ordered a bunk bed comforter, shams and an inseparable sheet set for my soon to be teenager’s loft bed. We are loving it! Very sturdy and quality fabrics and it fits like a glove. Many thanks!!" "Wanted to let you know that my son loves the sheets and blanket on his loft bed. It makes it a lot easier to make the bed and more comfortable sleeping. Thank you for your time that you spent on his order!" "I love my new sheets! I actually had never heard of inseparable sheets before, but I love them! They are so easy for my daughter to use, but an unexpected benefit is her not getting tangled up in the extra bedding that comes with typical bedding. It is good to know she is a bit safer at night! Thanks!"